Monorail landscaping? 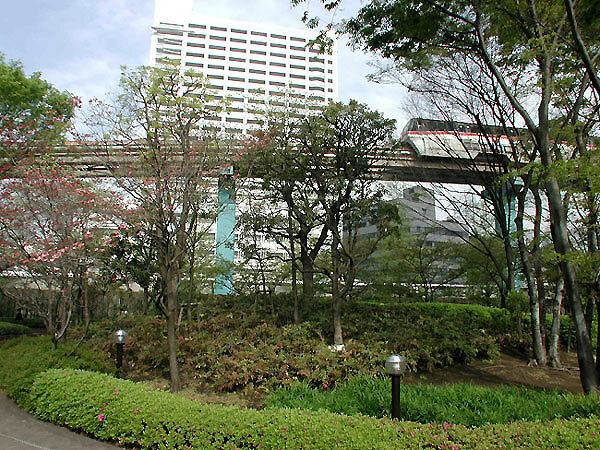 It's becoming more popular, and here we post some pictures of what monorail can look like in green spaces. While the Tokyo-Haneda Monorail runs mostly through industrial and residential areas, there are a few green spots along the route that we photographed as a study of "monorail and nature." Draw your own conclusions; is the monorail invasive, or does it blend with these natural surroundings? Just a short distance from the northern terminal Hamamatsucho Station is the Toshiba Building. 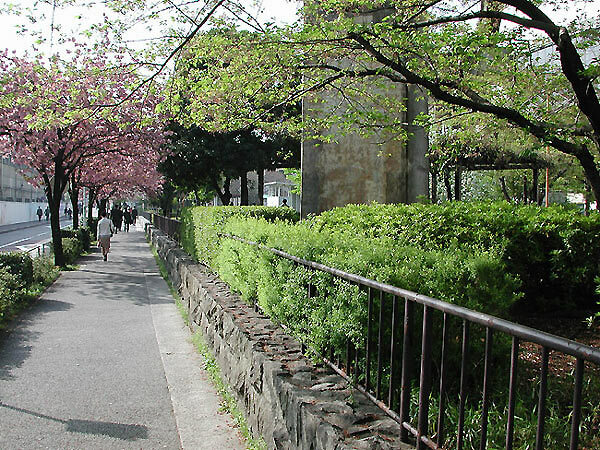 On the property of Toshiba is a beautiful linear park. High above the trees, the Tokyo-Haneda Monorail runs by every few minutes. Absolutely no one in the park area below seemed to notice it but the photographer during a week-long visit. At the south end of the park is a secluded circle with benches. Almost invisible was the monorail and track near by. Obtrusive noise? As most of us who have visited many of them know, monorails are very quiet. There were MANY other sounds from the surrounding area that drowned out the sound of the monorail. A water fountain would be louder than the monorail, and certainly a music festival would completely drown out the low-decibel woosh of a monorail passing by above. Along one side of the linear park is a pathway that thousands of area workers use to get to and from work. Not one person noticed the monorail passing high above during my many visits to this area, which included those visiting the park for some quiet time. This picture was taken during a non-commute hour while workers were already at their offices. 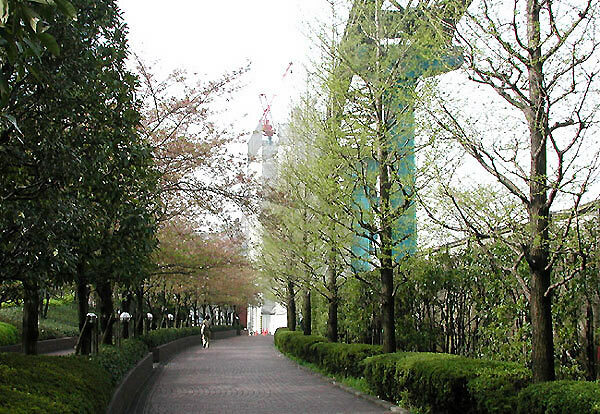 Further down the line is a playground/park where the monorail makes a 90-degree turn towards the Tokyo Bay waterways. 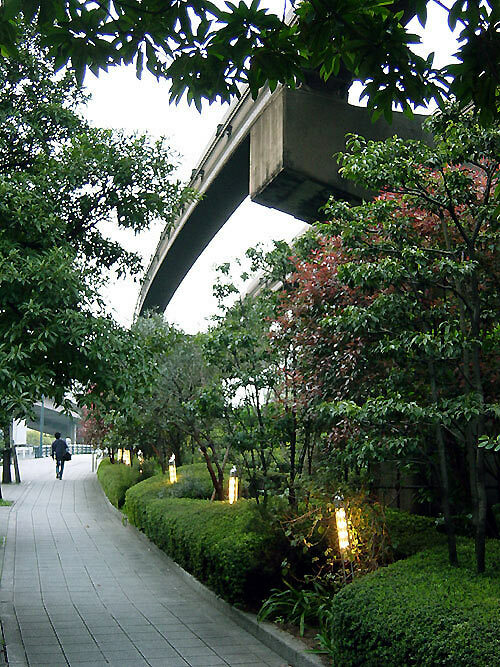 This image illustrates how lush vegetation can almost completely hide or disguise monorail pylons or track above. 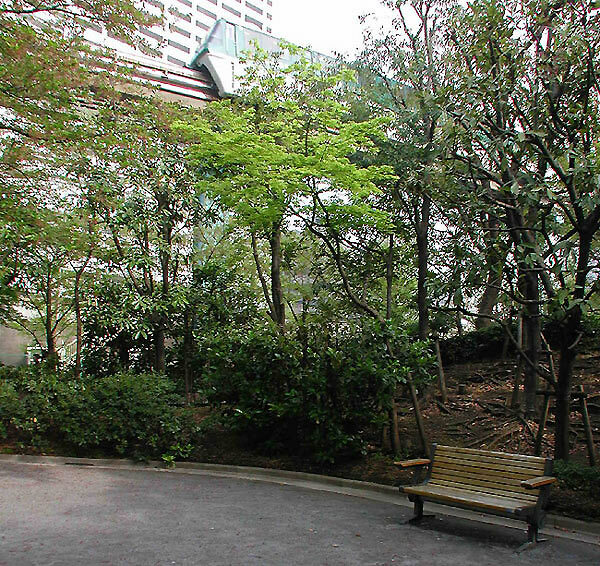 For a 360-view of this park and the Toshiba Building park, please visit our Panorama Pages. About half way between Hamamatsucho and Haneda Airport is another green spot. This image was taken in the early evening by David M. Ice. Even though the monorail track is quite low in this area, designers created a lush landscape that wraps around the supports and hides the structure. This bird at the Toshiba Building park decided to perch on the monorail t-support rather than a nearby tree. Monorails and nature; evidently a good match for this raven!